Joe Higgins struck the first ton of his career for Castor at Warboys. The Fenland derby in Cambs Division One proved a one-sided affair as Wisbech crushed March by 163 runs at Burrowmoor Road yesterday (June 10). Gary Freear (109) and Danny Haynes (40) put on 142 for the first Wisbech wicket as the visitors piled up 287-8 in their 50 overs. Ross Keymer cracked 111 for Ufford Park against Huntingdon. It was Freear’s third ton of the Division One season. He’s the leading run scorer in the competition with 543 in eight matches at an average of 77. Sam Albutt (56 from 44 balls) gave the Wisbech innings late impetus. In contrast March started dreadfully and were reduced to 18-4 before James Hilliard (40) and Tyler Phillips (37) added 82 for the fifth wicket. It was a brief recovery though as the last six wickets fell for just 24 runs thanks to Simon Freear (3-15) and Parth Patel (3-16). Kieran Haynes (3-30) had delivered the early damage. Wisbech star Gary Freear is top of the Cambs Division One run charts after smacking 109 at March. Wisbech are fifth and some way off the blistering pace being set by unbeaten top two Ketton and Foxton. Ketton won a key game at third-placed Saffron Walden by 79 runs yesterday. Ashley Rodgers (58) and Zeeshan Manzoor (51) scored best in Ketton’s 204 before their all-star spin attack claimed eight home wickets between them. Tom Sole (4-26) led the way. Reigning champions Foxton are 18 points behind Ketton, but they looked strong during a 78-run win over fourth-placed Ramsey. Craig Park’s 106 fired Foxton up to 273-9 and despite 66 from skipper Michael Cafferkey, the Rams fell well short in reply. Dan Bandaranaike enjoyed a good all-round day as Nassington beat Waresley by 56 runs. He top scored with 61 in Nassington’s 216-5 and then claimed two wickets as Waresley were dismissed for 160. Adam Morris (4-27) was the pick of the Nassington bowlers. 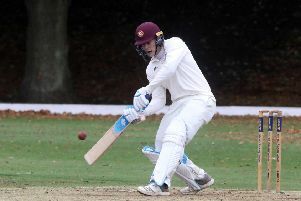 Aussie Joe Higgins claimed the first ton of his career as Castor pipped bottom club Warboys by two runs in Division Two. Higgins finished unbeaten on 109 and Castor needed every single run as they just managed to defend a team total of 209. Dockerill brothers Stuart and Cameron claimed four wickets apiece as Castor won for the first time in three matches. Ufford Park kept in touch with the leaders by beating fellow promotion contenders Huntingdon by 49 runs. Ross Keymer claimed his second ton of the summer in Ufford’s 290-5. He received most support from Tanvir Hussain who made 77. Ufford are fourth, two points behind third-placed Huntingdon and just five points behind leaders Kimbolton. Wisbech 287-8 (G. Freear 109, S. Albutt 56, D. Haynes 40, J. Gollands 31, C. Ringham 3-56, A. Wright 2-42). March 124 (J. Hilliard 40, T. Phillips 37, S. Freear 3-15, P. Patel 3-16, K. Haynes 3-30). Nassington 216-5 (D. Bandaranaike 61no, T. Norman 34, C. Craig 26, J. Pope 22). Waresley 160 (A. Scully 53, A. Morris 4-27, C. Craig 2-28, D. Bandaranaike 2-32). Ketton 204 (A. Rodgers 58, Z. Manzoor 51, T. Sole 32, J. Gallimore 21, J. Barrs 4-13, B. Harris 3-54-. Saffron Walden 125 (T. Sole 4-26, I. Saxena 2-18, Z. Manzoor 2-21). Ufford Park 290-5 (R. Keymer 111, T. Hussain 77). Huntingdon 241-9 (W. Javed 2-14, A. Larkin 2-19). Warboys 208 (C. Dockerill 4-35, S. Dockerill 4-40).